Professional carpet cleaning in the Upland/Rancho, CA area. Golden State Chem-Dry of Upland/Rancho‘s unique approach to carpet cleaning provides you and your family with a great overall carpet cleaning experience. We use the power of carbonation to extract more dirt and soil from your carpets and give them a deeper, longer lasting clean. Our carbonated cleaning solutions only require a fraction of the moisture that traditional steam cleaners use. This allows your carpets to dry quicker and helps prevent the growth of mold and mildew under your carpet. Once Golden State Chem-Dry is done with your carpets, you can see, feel and even smell the difference! We give you great carpet cleaning results by using our specialty Hot Carbonated Extraction carpet cleaning method. It’s drier, cleaner, and healthier than other carpet cleaning methods used in the Upland/Rancho, CA area. You probably already know steam cleaners work: they pump water into your carpets and then attempt to extract it all. You probably also know that this usually leaves your carpet sopping wet for a day or two before it dries. At Golden State Chem-Dry of Upland/Rancho, we use 80% less water so your carpets to dry much faster. When you choose Chem-Dry, you’ll never have to tip-toe around on wet carpet for days again. Our carbonated cleaning method works similar to the way that club soda removes stains. The carbonated bubbles reach deep into the carpet and explode the dirt and grime that has settled to the bottom and bring it right up to the surface. Then, our powerful cleaning equipment extracts the dirt and grime and leaves your carpets with a deeper clean. No dirt-attracting soap residue is left behind, so you know your carpets will stay cleaner for longer. Golden State Chem-Dry of Upland/Rancho uses an all-natural, green-certified cleaning solution so you don’t have to worry about any harsh soaps or chemicals being around your kids and pets. Our minimal-water method means there is almost no risk of mold and mildew growth under your carpet unlike with the excessive water left behind by steam cleaning machines. Additionally, an independent air quality lab found that our carpet cleaning method removes 98% of common allergens in your carpets and upholstery and 89% of airborne bacteria. All of this adds up to a safer carpet cleaning that you can trust is healthier for you, your family and your home. Working with Chem-Dry was outstanding. I’ve used other carpet cleaning companies in the past and I have never had one that did as good of a cleaning job. They are a pleasure to work with. They were prompt, polite, helpful and explained everything. I’ll be certainly calling them again when I need more cleaning in the future. Very prompt, professional & thorough. I could tell immediately that he enjoyed his job & took pride in his work. They earned one more Golden State Chem-Dry customer for life! Job well done! Superb carpet cleaning. Topnotch!!! Tyler did a pretty good job! He is very knowledgable and very professional…Always smiling, he explained everything he was about to do. This company deserves 10 stars :). I will definitely recommend to all my friends who also need carpet cleaning at their homes. Thanks, Golden State Chem-Dry and thanks to Tyler for doing a pretty good job!! 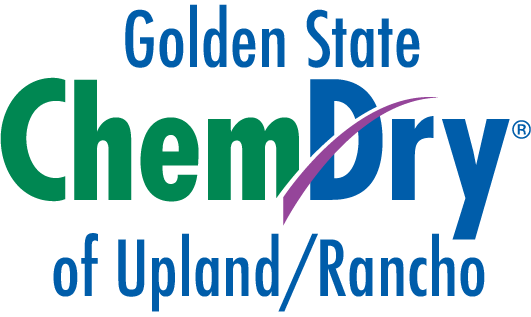 Golden State Chem-Dry of Upland/Rancho’s signature cleaning solution, The Natural®, is a cleaning mixture that combines with the power of carbonation and lifts dirt to the surface where it is easily whisked away. The Natural is non-toxic and ideal for homes with kids and pets and recently received the Green Certification. We are sure to meet your expectations with our thorough and healthy carpet cleaning service. The Carpet and Rug Institute (CRI) designated Chem-Dry as a company deserving the CRI Seal of Approval for the innovative and unique Hot Carbonating System. This program identifies effective carpet cleaning solutions and equipment that clean carpet right the first time. Our products help to protect a home or commercial facility’s carpet investment. The blue and green CRI Seal of Approval is proof that you are investing in a quality service. Call Golden State Chem-Dry For a Carpet Cleaning Today!